Every so often I get to review a product that sets itself apart from the “other guy” stuff. You know, the mass produced stuff that we often see in the brick-and-mortar stores. The special products are ones that are intelligently designed and built to exacting standards. It’s sort of like comparing a Mercedes to a Chevy. Nothing wrong with a Chevy, but just slamming the door on the Mercedes can make you go, “Whoa! Now that’s quality”! Cary Audio Design has been making beautifully designed and built audio equipment since 1989, and many of you may know them as being a leader in vacuum tube amplification and such. Cary, in fact, also makes a few solid state components. The CD-500 is an example of their quest to achieve a high performance product with some leading edge technology that offers quality and value. 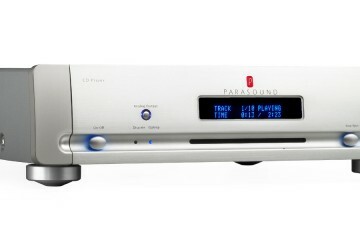 The CD-500 plays CDs (CD-R and CD-W) and also provides HDCD decoding. It has 192 kHz, 24 bit Burr Brown 1792u DAC chips in the digital to analog converter section. The CD-500 contains audio grade Elna capacitors in the audio circuit for improved musicality and bass definition. To ensure low jitter, it has three buffers, the first two being FIFO (first in first out). The final stage is the dual Burr Brown 1792u DAC chips that convert the digital signal to analog with extremely low jitter (around 90 picoseconds). It uses a ROM drive to buffer the data, which is said to improve the error correction by a factor of 100. The upsampling is achieved with DSP circuitry that expands the 16 bit audio to 24 bits, where it can then be upsampled to 96, 192, 384, 512, or 786 kHz for the analog output. Why is this important? Two primary factors determine the quality of digital audio: the word depth (bit number) and the sampling rate. The DAC measures the level of sound many times per second and outputs this level as digital data. A word depth of 16 bits can resolve the level of each sample to an accuracy of about1/60K, while a word depth of 24 bits resolves each sample to an accuracy of about 1/1.5 million. Each bit of word depth adds approximately 6 dB of dynamic range, so a 16-bit recording has a dynamic range of 96 dB, while a 24-bit recording has a dynamic range of 144 dB. So pumping the 16 bits up to 24 bits does not add data to the original signal, but instead of the 44.1 kHz sample rate used for standard CD, it can then offer sample rates of 48 kHz, 96 kHz or even higher. Ironically, the higher sample rate goal is to make the digital signal sound more like analog. The 44.1-kHz sampling rate gives you a frequency response up to around 20 kHz, while a 96-kHz sampling rate can achieve a 48 kHz frequency response. Outputs on the back include one coaxial, and one Toslink, a set of RCA outputs (unbalanced) and a set of XLR (balanced) outputs. The CD-500 is available with a silver or black anodized aluminum front panel with a matching color remote that is plastic with a metal faceplate. The lower third of the remote can also be used to control a matching Cary amplifier. The remote also has a volume function, so connecting the CD-500 directly to an amp is an option if you use the analog outs, or us the volume control to sound level match other components going through your processor. The remote is not backlit, but I do not find that to be as critical as I would with a video source remote. Weighing in at 24 pounds, this is a beefy piece of equipment and very solidly built. (I am referring, of course, to the Mercedes analogy from my opening statement). The front panel display is a blue VFD that shows the usual track information. Instead of displaying STEREO, it opts for L-R. Since it is a 2 channel player, it seems odd to bother with that on a display, unless perhaps it changes to show a mono CD, of which I have none. Also, flashing disc icons that goes up to 16 will provide a visual queue for what track is playing, even though the track number is clearly visible. That seemed redundant and not useful for discs with over 16 tracks. Once over 16, a +16 icon continues to flash for the duration of the playing time. On the other hand, I have a player now that doesn’t display what track is playing at all, just the total time elapsed. Now that’s annoying! When a HDCD is being played, a blue LED in the upper right hand corner of the CD-500 lights up. This was a nice feature as it led to the discovery of a disc that I have that is not labeled as a HDCD. More about that later. The disc tray was sturdy and quick to open and close. The faceplate is made of thick aluminum and the top and sides are thicker than most mass market devices you find today. The back has solid RCA jacks for you analog connectors. Other than a standard power cord, no other cables come with the Cary. 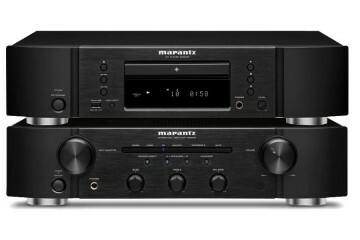 The CD-500 exudes quality in construction, and in my opinion, just looks great. But what about the performance? 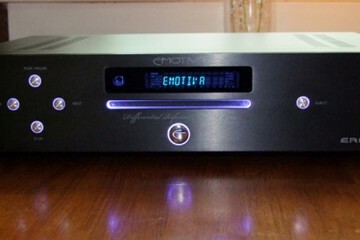 To take advantage of the CD-500’s DAC, I hooked it up to my Emotiva UMC-1 pre/pro via the analog outs, using Kimber PBJ (Ppeanut Butter & Jelly, I kid you not!) interconnects. I set the pre/pro to DIRECT, so that it would not interfere with the original output signal. The sample rate converter (SRC) can be controlled via the remote or the front panel on the CD-500. A blue LED indicator keeps track of your selected sample rate. Frankly, I could not hear a difference above the 192 kHz sample rate, but running with 192 kHz presented a very noticeable improvement over the 44.1 kHz basic Redbook sample rate. I ended up doing most of my reviewing using the CD-500 DAC with 192 kHz SR engaged. Toggling back and forth allows you listen to sound changes from your seat and kept me busy listening for sonic changes while playing music I have been listening to for years. Eventually, I just settled in and listened to music for enjoyment and not strictly for analysis. Everything Waits to be Noticed: Adult contemporary with Art Garfunkel, Maia Sharp and Buddy Mondlock that features acoustic jazz flavors with a wonderful blend of voices. (I’ve always secretly wished I could sing like Arty, but don’t tell anyone). The CD-500 gave a rich, full sound with great staging and detailed minutia of the instruments being played. Bass was very solid and tight. The intake of breathe before a voice comes in could be heard upon occasion. Vocals were a bit more forward into the room than I recall from hearing before. I noticed the vocal shift was also part of a broader, deeper soundstage, as though the entire ensemble moved their chairs and microphones out to provide more elbow room. This was a consistent effect that was noticeable on everything I played on the CD-500 when compared to my standard (Oppo 980H) CD player. Brass, kick-drum and electric guitars had plenty of bite and snap. Overall, music sounded natural and “live”. By the way, this was the disc that was not marked as HDCD, but to my surprise the blue light came on before track one started playing. Sweet! Just so you know, the CD-500 does not upsample HDCD when played in PCM, but plays it at 44.1 kHz. This is due to the inherent algorithm design used to process HDCD. I love HDCDs and have several, mostly from Reference Recordings. It was a nice surprise to find this disc was one as well. Antal Dorati Conducts: I selected this disc because it was well performed, yet comes from an old analog tape master that has some hiss that is noticeable in the quiet passages. The hiss is mainly due to the limitation of the tape noise floor, but it can also reveal small details in the actual recording process, such as squeaky chairs, rustling sheet music and things that when the original LP was made, you would never have been able to hear due to the higher noise floor of the LP medium. In other words, the master tape would have sounded more detailed then the LP that was cut from it. Small sonic details were often obscured by the cut vinyl and rumble of the turntable. In any case, these details do manifest themselves now because of the increased resolution provided by the increased dynamics found on digital media. I could hear more of the extraneous noise in the recording at 196 kHz than at 44.1 kHz. Now you might think this is bad, but I like the idea that I can hear into the actual recorded event and probably hear the same things Mr. Dorati heard from his podium some 50 years ago. Today’s orchestras work closely with the sound engineers to reduce these noises because they know they will show up on a digital medium (padded chairs, carpeted podium, ventilation system masking, etc.). In any case, the hiss was not increased so much as the details became more apparent. Yes, I could hear the chair squeak and the podium creak, but the sound of the orchestra was beautiful presented. The music itself was expansive and rich while giving no hint that it was recorded over 50 years ago. The Cary brought out all of the hidden details and gave a sense of air and natural space around the orchestra. Again, the bass in particular had weight and punch. 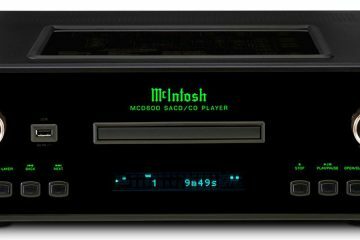 On my standard CD player, I never got to completely hear the minutiae of detail that the CD-500 brought out. Britten- Young Persons Guide to the Orchestra: An awesome recording in SACD and HDCD by the famed Prof. Keith O. Johnson. This disc allowed me to compare the higher resolution of the SACD layer to the enhanced resolution of the HDCD layer. I down mixed the SACD to two channels on my Oppo 980H and listened for the comparison with the CD-500 playing the HDCD version. Both sounded remarkably similar. In a blind A-B test, I would have been hard pressed to tell which was playing what at any given time. The low end on this recording is amazing. The beginning of track two starts with a kettle drum whack that is quite powerful and will make the unsuspecting person jump (namely me, the first time I heard it). The CD-500 presented a very stable, wide and deep soundstage. It conveyed a sense of space that I had not heard before in my two channel listening. It almost equaled the multi-channel sound space from the Oppo. Very satisfying, indeed! In conclusion, my recommendation is this. If you are a casual listener of music, or an MP3 or streaming fanatic, the Cary CD-500 is probably not for you. If however, you really listen intently to your music and have a burgeoning wall full of CDs, you owe it to yourself to hear what a well built, well designed stand alone CD player can do for your music. 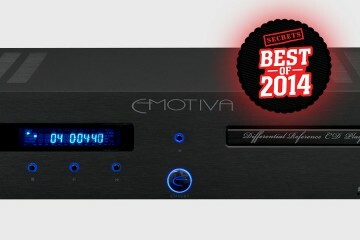 Like the CDs you love, your CD player should last a lifetime. The Cary Audio Design CD-500 is as well crafted as the sound it recreates. Maybe it’s time to for you to dump that old Chevy and get the Mercedes? After all, there is no substitute for quality.